In a jaw-dropping story published in the Sydney Morning Herald, it is revealed that the Australian art world’s man on the run, Ron Coles, is being pursued by what is described as an ‘outlaw bikie gang’. 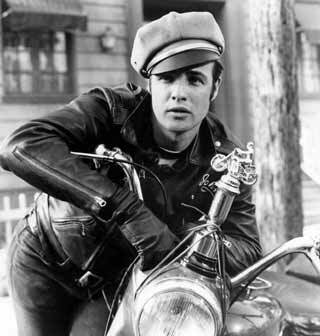 Although they didn’t specify exactly which outlaw bikie gang it is, I doubt it’s of the relatively blancmange ‘Brando in The Wild One‘ variety whose most threatening move would have been to throw a double choc-malt milkshake in your face. Anyway, it seems Coles may have absconded with millions of dollars belonging to this group of bikies. The article implies that he was laundering their money through his ‘Investment Gallery’, buying art with slightly tarnished cash and handing back wads of crisp, clean, brand-spanking new legitimate moola. I don’t know quite what to say to this. Other than… ARE YOU INSANE? Oh. And Run, Ron, Run.